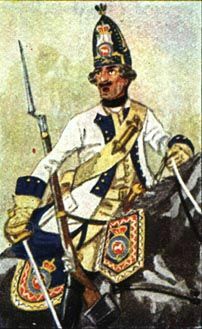 The Hanoverian Army 1756-63 . 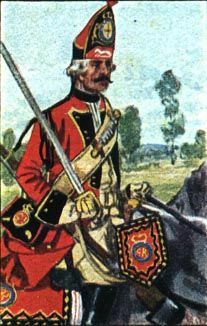 A major component of His Britannic Majestie's Army in North Germany during the Seven Years War. 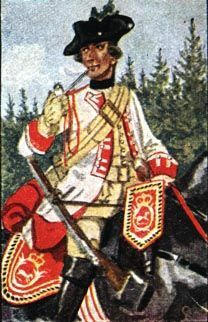 H.23. 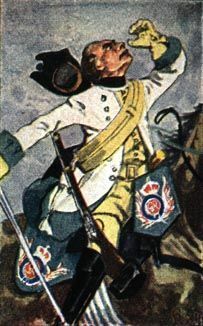 Pz Ferdinand of Brunswick mounted and on foot. 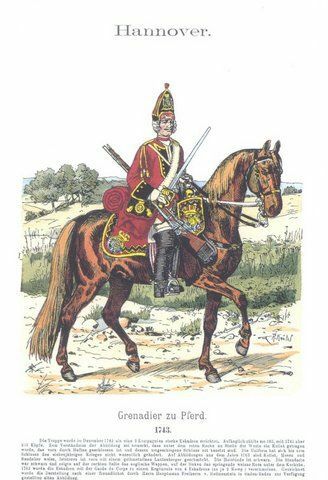 a desire to get all Hanoverians as Hanoverians and not just ameneded/converted Brits..sashes over the correct shoulder, pigtails on grenadiers , all that sort of thing..proper mounted types rather than Brits in different colours..
That is a big project. Why has it not been done prior by anyone else? 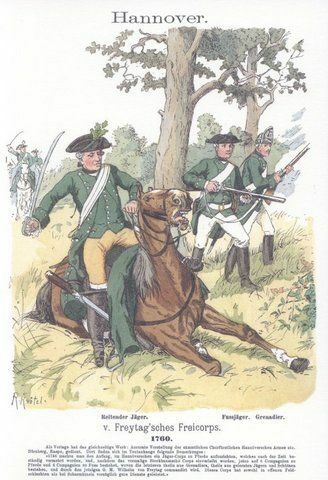 pose to be most formal , for regular infantry and cavalry..for infantry; looking straight ahead, no frelling talkinf, looking around, smirking or whatever,,nothing like that at all.....with muskets in the rather oddly named "march attack" pose all in step , a bit like that odd fellow Frank hammonsd Minden miniatures stuff, indeed just like his but with less bulky tunic skirts , I dont like his tunic skirts....Cavalry with a hint of arrogance..for those who don't know 28mm SYW is one of wargames growth areas,, size wise to match Perrys ..a bench mark well worth the effort..
it sort of has been but never been done comprehensively .like my eureka Saxons which had never been done comprehensivly but seem to have sold like hotcakes..I would like to add a bassoon and oboe but the Eureka ones might do..it is only recently where people have had the chance to air their grievances with the paucity of proper SYW stuff..any way I am going to pst this on TMP..blame Der alte Fritz...he reminded me of it..just watch the orders for it.. I would take the same as Cardinal! 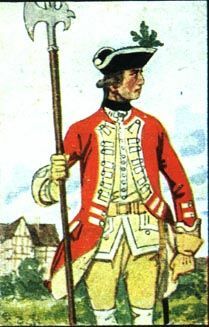 hmmm - any drawings of the uniforms to give us 'uneducated types' an idea as to what to expect? 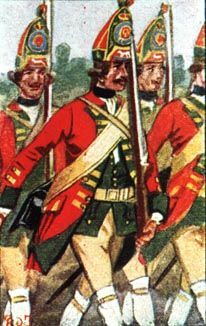 I was hoping to do a British SYW army, but this lot could be better. 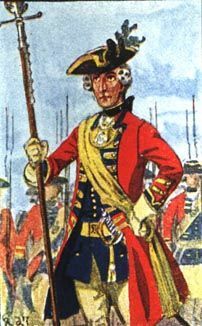 well yes..but will take some time to pull it together..as for an SYW British, well a Hanoverian army is around 2/3rds of an SYW British Army!!!! 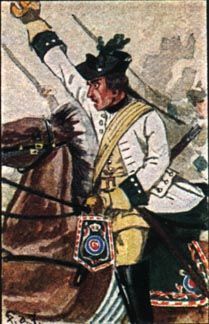 for much of the time it was about 3/4 of the "British" Army ,and commanded by a Prussian General of Brunswick background..Well the Brunswick contingent next!!! 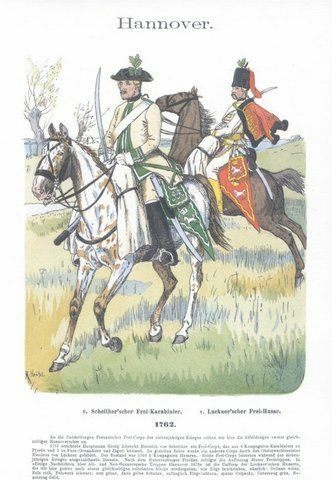 and some Shaumberg lippe Buckerburg caribiners..actually to include those in the Hanoverians! How many variants of each figure would you want? It would allow me to gauge the potential cost of commissioning. ok well the short answer is 1 of each, some variation of face would be nice but 1 of each is all it needs..everbody doing the same thing, in step, at the same time..except for the gunners..maybe four of them..
two jaeger poses would be nice, but not mandatory.. 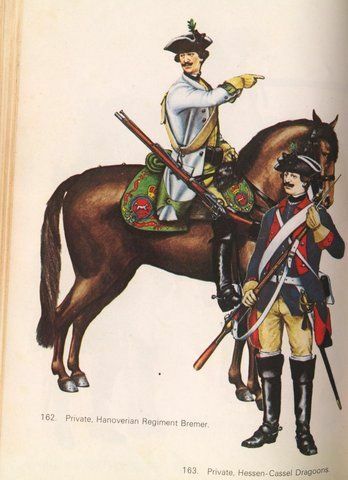 Very dumb question - did the cavalry dismount to fight much in the SYW? 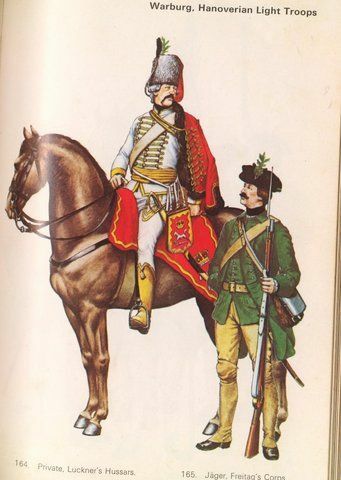 I want mine for skirmish games (Sharpes Practice), and i noticed the Hussars from Eurek posted elsewhere on the forum had dismounted variants... any chance of dismounted Hannoverians? 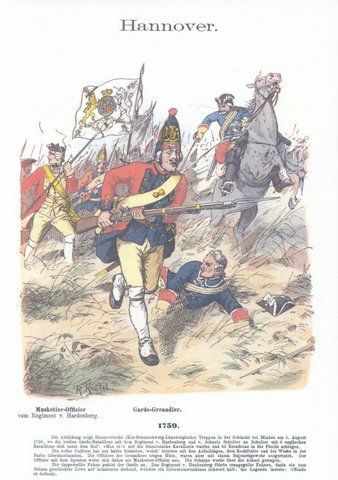 they only had the one regiment Eureka would cover them..other cavalry dismounted only very reluctlantly..that was what god invented infantry for..walking..
Ok my army using BG, also standard bearer for the Inf? Not sure about how much up front Matt, depends on what the commission cost comes in at. I am happy to say that this project has some legs to given the 3 requests so far. You may need to start fleshing out the details on these guys and if you want and how many variants. However, there does not seem much interest on TMP at this stage?? BattleScape wrote: However, there does not seem much interest on TMP at this stage?? Which is why I posted a reply there about how good the low $AUD would be for gamers wanting SYW Hannoverians sold Downunder. I would want to see details on the minis, particularly the poses which would need to be suitable for skirmish games for me. it is Christmas and that sort of thing.. I emailed a few people.. I would have no problem doing a couple of skirmish type variants if there was enough interest. 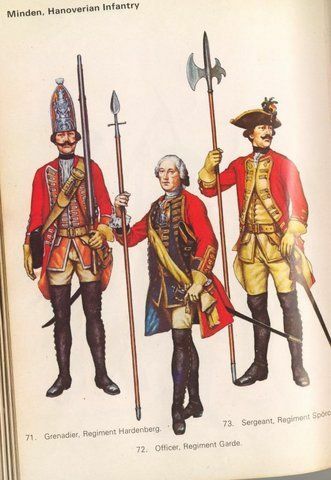 Using the Muskets as an example, do you only want one figure done? 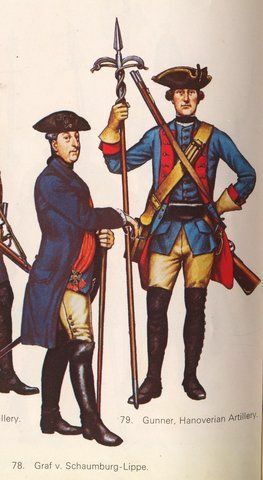 Or a couple of variants with different faces, slight different leg position (same step in order step though as required), Just small variations that still make the unit look uniform. 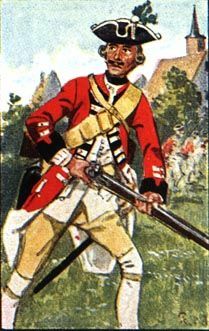 slighly differnt faces fine , no different legs variations, they would be beaten if they had got it wrong, and no heads turned anyway but staring straight ahead..skirmishing would be nice for Jaegers .. a Firing Musketeer and Grenadier would be nice as well if you could go that far..but as I said not necessary..any extra figures would be things like Grenadier fifer..dead or wounded moral marker figures(this is not a bad idea at all) a Grenadier Sapper..an Oboe and Bassoonist..